Michael Halasz, Czech Chamber Philharmonic Orchestra Pardubice. Naxos 8.573488. Maybe you think of Haydn as I do, as a composer of about 800 symphonies and chamber pieces. No, no, no. He also wrote a slew of operas, most of which we never hear anymore, even though people seemed to love them in their day. 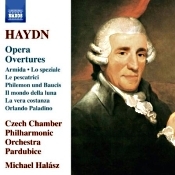 Anymore, about all we hear from his operas are the overtures, the present album containing some fourteen of them, ably performed by Michael Halasz and the ambitiously named Czech Chamber Philharmonic Orchestra Pardubice. The smallish orchestra, comprised of about thirty or so players, is just the right size for Haydn. We get an intimate, fairly transparent presentation from this size an ensemble. Not so small that that it diminishes the weight Haydn's work but small enough to capture the zest and vigor of his music. Maestro Halasz does a good job keeping them on their toes and ensuring the scores get just treatment. I've always suspected it's hard for any conductor to go too far wrong in the scores of Haydn or Mozart or Schubert. The music is simply too delightful. Nevertheless, Maestro Halasz does an extra-special job with it. Although he never takes anything at a breakneck speed, he and his crew do provide a zesty, frothy mixture of notes. The works are lightweight, to be sure, and the listener will probably have a hard time telling one from the other; still, Halasz does his best to differentiate them so it doesn't all sound the same. Among my own favorites from the album were The Fisherwomen for its vitality; Infidelity Outwitted for echoes of Handel; The Deliberations of the Gods for its relative gravitas; Life on the Moon, just because it's fun; and Orlando the Paladin because of its high spirited nobility. But not to like any of it is to quibble. It's a hearty enjoyment. Producer Jiri Stilec and engineers Vaclav Roubal and Karel Soukenik recorded the album at The House of Music, Pardubice, Czech Republic in January 2015. If played too loudly, the sound has a tendency to appear rather close; played at a normal (or more realistic) level, however, it's really quite good. There's a nice stereo spread, with uncommonly good depth, and a pleasantly warm, ambient glow. Because there aren't a lot of players involved, the sound is clearer, more lucid, than you might get from a full orchestra, yet the hall's natural bloom prevents the sound from becoming harsh or bright. It's all very natural and welcome. 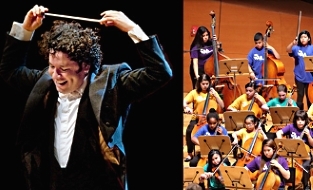 Cal Performances at UC Berkeley presents, as part of its Berkeley Radical initiative, Gustavo Dudamel conducting the Youth Orchestra Los Angeles (YOLA) on Sunday, October 30, 2016 at 3pm at the Paramount Theatre in Oakland. This family-friendly matinee performance, lead by the music and artistic director of the Los Angeles Philharmonic, features YOLA musicians ages 12-18 performing works by Bernstein, Beethoven, Brahms, Dvorák, and John Williams. The concert concludes a day of Bay Area music education activities with a focus on personal transformation, hosted and produced by Cal Performances for the traveling musicians of YOLA, Bay Area El Sistema groups and their families, Oakland Symphony's MUSE (Music for Excellence) students, and the instrumental music students of the Oakland School for the Arts. While guests of Cal Performances, YOLA musicians will also explore the UC Berkeley campus hosted by members of Student Musical Activities (SMA), a program of Cal Performances. Tickets for the 45-minute concert are priced at an affordable $5 allowing all to attend. Matías Tarnopolsky, artistic and executive director, shared, "Cal Performances launched Berkeley Radical in September of 2015 with Gustavo Dudamel conducting Beethoven's Ninth Symphony with the Simón Bolívar Symphony Orchestra of Venezuela in a historic season-opening concert at the Hearst Greek Theatre. This season, in our second year of Berkeley Radical, we expand our partnerships further by presenting a day-long exchange of music and learning with a wonderful performance by the Youth Orchestra Los Angeles and Gustavo Dudamel in Oakland's historic Paramount Theater as the centerpiece." Gustavo Dudamel shared, "My collaborations with Cal Performances have always been about sharing music as broadly as possible with the people in our communities and beyond. I am very happy to return, this time with 80 of the most accomplished musicians of YOLA, on the very special occasion of the 10th anniversary of the program, and am excited to continue building bridges between the young people of Los Angeles and the young musicians in the Bay Area." Tickets for Gustavo Dudamel and the Youth Orchestra Los Angeles are general admission and go on sale to the general public on Tuesday, August 9 at noon. Tickets are priced at $5 and are available only at Ticketmaster.com. Lawrence Brownlee is excited to announce his 2016/17 season, featuring a mix of opera performances and recitals in the U.S. and Europe, as well as a new album with Delos Records to follow-up on his Grammy-nominated recording of Virtuoso Rossini Arias. The season begins with an extended run of American performances, beginning with Seattle Opera's new production of Le Comte Ory (Aug 6-20), followed by Lawrence's San Francisco Opera debut singing Ernesto in Don Pasquale (Sept 18-Oct 15). From there he'll head to DC just in time for the election, joining the Washington National Opera for Fille du Régiment (Nov 11-20). He'll cap the year with a December 6 performance at Carnegie Hall, joining acclaimed producer Ray Chew for an evening of gospel and spirituals. Lawrence returns to the US in 2017 to bring his acclaimed interpretation of Charlie Parker in Yardbird to the Lyric Opera of Chicago (Mar 24-26). While there, he'll also perform a joint recital with Eric Owens April 9. He'll finish his U.S. presence up with a trip to Houston Grand Opera for Mozart's Abduction from the Seraglio (April 28-May 12). Brownlee will also return to Europe, following last year's acclaimed performances with Opera National de Paris and Opernhaus Zürich. He will sing Semiramide at the Bayerische Staastoper (Feb 12-Mar 3), Le Comte Ory at Klangvokal Dortmund (May 28), and another run of Yardbird at English National Opera (June 9-17). Park Avenue Armory, NYC, will present "Circle Map," two evenings of immersive spatial works by internationally acclaimed Finnish composer Kaija Saariaho performed by the New York Philharmonic under the baton of its Marie-Josée Kravis Composer-in-Residence Esa-Pekka Salonen on October 13 and 14, 2016. Conceived by Pierre Audi to take full advantage of the Wade Thompson Drill Hall, the engagement marks the orchestra's first performance at the Armory since 2012's Philharmonic 360, the acclaimed spatial music program co-produced by the Armory and Philharmonic. A program of four ambitious works that require a massive, open space for their full realization, Circle Map will utilize the vast drill hall in an immersive presentation that continually shifts the relationship between performers and audience. The staging will place the orchestra at the center of the hall, with audience members in a half-round seating arrangement and performances taking place throughout. Longtime Saariaho collaborator Jean-Baptiste Barrière will translate the composer's soundscapes into projections that include interpretations of literary and visual artworks from which inspiration for specific compositions are drawn. "Our drill hall is an ideal setting and partner for realizing spatial compositions, providing tremendous freedom for composers and performers," said Rebecca Robertson, President and Executive Producer of Park Avenue Armory. "After the New York Philharmonic's phenomenal performances in 2012, we are delighted to welcome these incomparable musicians back to our Wade Thompson Drill Hall for an evening of works by one of our most distinguished living composers." "Kaija Saariaho is a composer of limitless imagination, whose vivid musical tapestries epitomize the spirit of artistic experimentation that we celebrate at the Armory," said Pierre Audi, Artistic Director of Park Avenue Armory. "We are so proud to present this interpretation of four of her most haunting compositions by one of the world's great symphony orchestras and within this exceptional setting, where Kaija has long wanted to have her spatial works performed." Since 1997, YPC's Concert Chorus has been invited by presenters and festivals on four continents to sing for their audiences. This summer, we were honored to begin our journey at SummerStage here in New York City, with a pre-curtain (and post-thunderstorm) performance to The Classical Theatre of Harlem's Macbeth. With one concert and two and a half weeks of rehearsals under our belts, we headed out west to tour in Napa Valley, California and Austin, Texas. Back by popular demand, YPC headlined two shows at the 11th Annual Festival Napa Valley: American spirituals on July 21st at the exquisite Mont La Salle Chapel, with acclaimed operatic baritone Lester Lynch, and the festival's Community Concert at Lincoln Theater on July 23rd. Read about our powerful Mont La Salle performance, from the perspective of proud choristers and from a wowed Napa Valley Register reviewer. YPC's Texas tour premiere was action-packed, with a KUTX radio show feature, previewing our summer tour finale performance; an in-depth music education workshop for over 100 music educators of the Austin Independent Schools District, the heart of Austin's public education; and a final performance at the historic Paramount Theatre on July 26th, with special guest Ruthie Foster, that ended with a Texas-style, hooting and hollering standing ovation. Chorister Adonis remarked, "Seeing my fellow choristers cry tears of joy after our concert at the Paramount Theatre in Austin is a sensation I'll never forget." Save the dates: November 4th at National Sawdust and November 6th at Merkin Hall at Kaufman Music Center. The concert will feature six world premieres and works from six incredible composers: Mason Bates, Joan La Barbara, Michael Gordon, Jessie Montgomery, Robert Xavier Rodriguez, and Charles Wuorinen. Ticket information is forthcoming. Jennifer Scott has been appointed Director of Public Relations of the Los Angeles Master Chorale, a resident company of The Music Center of Los Angeles County, led by Artistic Director Grant Gershon and President & CEO Jean Davidson. Scott begins her new role September 2. She moves to Los Angeles from Charleston, South Carolina where she has been the Director of Marketing and Public Relations for Spoleto Festival USA for the past two years. 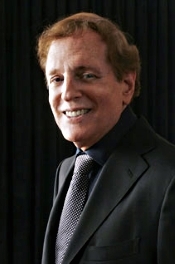 Scott was formerly a senior publicist at New York City-based Shuman Associates, Inc. working with clients such as the San Francisco Symphony, San Francisco Opera, The Cleveland Orchestra, cellist Alisa Weilerstein, pianists Jonathan Biss and Inon Barnatan, and on national public relations for Spoleto Festival USA. Prior to joining the festival staff, she was Communications Manager for the Las Vegas Philharmonic and has an extensive background in arts publicity and as a magazine editor and journalist in her native New Zealand. The St. Charles Singers has announced plans for its 33rd concert season, which opens October 15 with a new installment of the professional chamber choir's "Mozart Journey," its multiyear project to perform Wolfgang Amadeus Mozart's complete sacred choral music. The mixed-voice ensemble, conducted by founder and music director Jeffrey Hunt, will present three different concert programs during its 2016–2017 season: "Mozart Journey XI: Mannheim and Beyond" in mid-October; an all-new "Candlelight Carols" holiday program in early December; and an all-American program in early June, giving local concertgoers a preview of what the St. Charles Singers will perform on its concert tour in England later that month. Single tickets for each of St. Charles Singers' 2016–2017 concerts are $35 adult general admission, $30 for seniors 65 and older, and $10 for students. Season subscriptions to all three concerts are available at a 20 percent discount from single-ticket prices through September 30, 2016. Tickets and general information about the St. Charles Singers are available at www.stcharlessingers.com or by calling (630) 513-5272. Tickets are also available at Townhouse Books, 105 N. Second Ave., St. Charles (checks or cash only at this ticket venue). Tickets may also be purchased at the door on the day of the concert, depending on availability. Group discounts are available. Bang on a Can's 2016-2017 season continues the "relentlessly inventive" (New York Magazine) new music collective's mission to create an international community dedicated to innovative music, wherever it is found, with performances throughout the U.S., Canada, and Europe, plus two new Bang on a Can Institutes for emerging composers and performers in Neuwied, Germany (November 21-26, 2016) and Abu Dhabi (February 2-5, 2017). Bang on a Can's New York season includes its annual People's Commissioning Fund Concert (January 9); a special concert at Carnegie Hall curated by Steve Reich celebrating the music of Bang on a Can co-founders Michael Gordon, David Lang, and Julia Wolfe (April 19); the 30th Anniversary Bang on a Can Marathon (May 2017), and ongoing "Bang on a Can Presents" curating partnerships with The Jewish Museum and The Noguchi Museum. In addition, Julia Wolfe's Pulitzer Prize-winning work Anthracite Fields will tour the U.S. throughout spring 2017, and the All-Stars will continue to premiere new works in their Field Recordings initiative internationally. Bang on a Can has appeared annually throughout the U.S. and Europe's most prestigious concert halls and festivals, as well as in Argentina, Australia, China, Korea, Uzbekistan, Kyrgyzstan, Kazakhstan, and Russia. The New York Times reports, "[Bang on a Can's] impact has been profound and pervasive. The current universe of do-it-yourself concert series, genre-flouting festivals, composer-owned record labels and amplified, electric-guitar-driven compositional idioms would probably not exist without their pioneering example." Now, Bang on a Can brings the community-fostering model it has developed for the past 15 years in its annual Bang on a Can Summer Music Festival at MASS MoCA in North Adams, MA, to two new locations – Neuwied, Germany in partnership with Villa Musica Rheinland-Pfalz, and Abu Dhabi in partnership with NYU Abu Dhabi. In both locations, Bang on a Can All-Stars members as well as co-founders Gordon, Lang, and Wolfe will work with students and young professionals to explore American contemporary music, passing on the Bang on a Can ethos and approach to "making music new" to the next generation of musicians and bringing an unexpected view of what American music is to other parts of the world. The Music Institute of Chicago announces the 2016–17 season of its Faculty and Guest Artist Series, showcasing noteworthy keyboard artists, illustrious alumni, and the legacy of Louis Armstrong. All but one of the concerts take place at the historic Nichols Concert Hall, 1490 Chicago Avenue in downtown Evanston. In March, the Music Institute presents one special performance at its partner venue, Fourth Presbyterian Church, 126 E. Chestnut Street in downtown Chicago. Saturday, September 24, 7:30 p.m.
Family Concert: Duke It Out! Saturday, December 10, 10 a.m. and 2 p.m.
Saturday, March 4, 7:30 p.m.
Friday, May 5, 7:30 p.m.
Saturday, May 20, 7:30 p.m.
All performances—except the March 3 concert, which takes place at Fourth Presbyterian Church, 126 E. Chestnut Street in Chicagotake place at Nichols Concert Hall, 1490 Chicago Avenue in Evanston. Tickets, except where noted, are $30 for adults, $20 for seniors and $10 for students, available online or 847.905.1500 ext. 108. All programming is subject to change. For more information, visit musicinst.org. Music Director Joana Carneiro and Berkeley Symphony open their 2016-17 season, their eighth together, on Thursday, October 13 at 7 pm with the world premiere of a commission by the Orchestra of a new work by Paul Dresher, Crazy Eights & Fractured Symmetries; Stravinsky's Petrushka; and violinist Philippe Quint performing Erich Korngold's Violin Concerto at Zellerbach Hall in Berkeley. Well-established as a presenter of major contemporary orchestral works, Berkeley Symphony continues its steadfast commitment to presenting original and unique programs with new music commissioned by living composers, many of whom Berkeley Symphony has developed an ongoing creative and collaborative relationship. In addition to the Paul Dresher world premiere, Berkeley Symphony's 2016-17 season includes a performance of James MacMillan's Symphony No. 4, which is a new co-commissioned West Coast premiere, and the Bay Area premiere of Mason Bates's Cello Concerto, with Joshua Roman as soloist. The Orchestra will also perform Shostakovich's epic Symphony No. 13, "Babi Yar", with bass Denis Sedov and alumni of choruses including the UC Berkeley Chamber Chorus, the Pacific Boychoir Academy, and members of the St. John of San Francisco Russian Orthodox Chorale, led by Marika Kuzma. Shai Wosner is soloist in Beethoven's Piano Concerto No. 4, and the Orchestra performs Beethoven's Symphony No. 4. Since its 1979-80 season, Berkeley Symphony has performed 64 world premieres, 28 U.S. premieres, and 21 West Coast premieres. In recognition of its leadership in commissioning and creating new music, the Orchestra has received the prestigious ASCAP Adventurous Programming Award in 10 of the past 13 seasons. Paul Dresher, a musical omnivore who incorporates global musical influences into his compositions, has been widely commissioned and has written experimental opera and music theater, chamber and orchestral compositions, and scores for theater, dance, and film. The composer, who earned his bachelor's degree in music at Cal, has had a long and fruitful relationship with Berkeley Symphony, including commissioned performances of his new works, mentoring in the Orchestra's educational programs, and speaking at preconcert talks. His 2012 Concerto for Quadrachord and Orchestra was given its world premiere by the Orchestra under Carneiro; he invented the quadrachord, among other instruments. Carneiro also led the Orchestra in Dresher's Cornucopia in 2010. Tickets for the Berkeley Symphony concert October 13 are priced at $15 to $74 and are available by phone at (510) 841-2800, ext. 1, and on-line at www.berkeleysymphony.org. Lorin Maazel, violin. London Symphony Orchestra. Philips 289 470 400-2. Esteemed conductor and violinist Lorin Maazel tells us in the booklet note that his father was an ardent admirer of the early twentieth-century violin-tenor duets of Fritz Kreisler and John McCormack and that he collected many of their popular recordings. 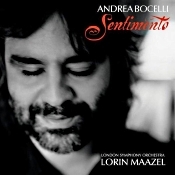 So when the opportunity came for Maazel to record such material with Italian classical tenor Andrea Bocelli, he jumped at it. The result in this 2001 release is more than a series of popular Italian songs, however, as the compositions involved include not only familiar works by Tosti and Martini but pieces by Rodrigo, Leoncavallo, Offenbach, and Rossini as well. The result is an entirely satisfying collection of familiar, if still lightweight fare. The listener may not mistake Mr. Bocelli's voice for the mellifluous timbres of Domingo nor the electrifying highs of Pavarotti, but it sounds surprisingly flexible and flowing, with a sturdy tone and a wide range. I confess my own previous acquaintance with the artist had been in bits and pieces of PBS specials on TV, hardly a fair way to judge the man's vocal qualities. I was delightfully surprised, therefore, when I heard him on disc, although I was not as overwhelmed by his talents as many people are. The term "Sentimento" for the album derives from the fact that all of the chosen songs are connected to strong personal feelings and emotions, the selections largely ballads or romantic repertoire. In addition to the popular songs of Tosti, there is a vocal rendition of the second movement of Rodrigo's Concierto de Aranjuez, Offenbach's "Barcarolle" from Le Contes d'Hofmann, Liszt's Liebestraum No. 3, and others. It's incorrect to say these are purely duets, however, as the two men (Bocelli and Maazel) are discreetly accompanied by the London Symphony Orchestra. 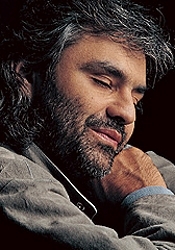 The Philips recording of Bocelli's voice sounds superb, ringing loudly and clearly but not too forwardly, with the violin well balanced by his side. The orchestra, however, is another matter, which may please some listeners and bemuse others. At first one hardly notices the orchestra, probably a plus as the ensemble should not draw attention to itself. Later, one notices the instruments do not appear as well focused as they should, and they don't just spread out behind the soloists but practically envelop them. It's not an unpleasant sonic experience, but an oddly different one. 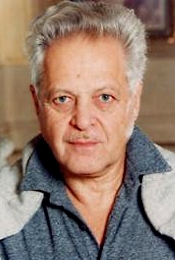 Efrem Kurtz, Philharmonia Orchestra. Hi-Q Records HIQXRCD51. 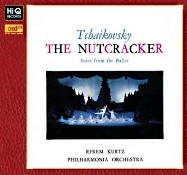 Conductor Efrem Kurtz (1900-1995) recorded the present suite from Tchaikovsky's Nutcracker in 1958, about the same time as he recorded highlights from Tchaikovsky's Swan Lake, which I reviewed a few weeks earlier. The performance under review is a typically good, lively account of the score from this conductor, although it doesn't quite have all the enthusiasm and ebullience I found in his interpretation of Swan Lake. Nevertheless, the biggest question is probably whether the audiophile remastering from Hi-Q Records is worth the extra money you'll pay for it in terms of performance and sound. There are, after, a huge number of recordings of the work already out there at a fraction of the cost. The answer to the question of worth is yes...and no. Let's consider it. As I'm sure you know, the Russian composer Peter Tchaikovsky (1840-1893) adapted his two-act ballet The Nutcracker from E.T.A. Hoffman's story "The Nutcracker and the Mouse King," and he premiered it in 1892. However, he didn't like it. Indeed, friends said he hated it, especially compared to his previous ballet, The Sleeping Beauty. It's ironic, then, that in our own time The Nutcracker has become possibly Tchaikovsky's most-popular, nay most-beloved, work and maybe the most-popular ballet of any kind ever written. Certainly, it has a little something in it to make everybody happy, particularly at Christmas time. The suite that Kurtz gives us offers most the ballet's most well-known music, and Kurtz does an admirable job making it all sound familiar and comfortable. That may be his downfall, too, in that the performance, as delightful as it is, doesn't really do much more than most other performances do. Everything sounds letter-perfect without being particularly distinguished. What is distinguished, though, is the playing of the Philharmonia. The orchestra sounds as rich and elegant as any orchestra has ever sounded. The result is an orchestral presentation as naturally buoyant, articulate, and precise as any you'll find. Anyway, it's hard to fault anything Kurtz does here. The music dances all bouncy and cheerfully throughout. When it needs a healthy dose of adrenaline, Kurtz provides it. In other words, everything is as you would want it, with a nice balletic lilt to the big tunes. But so it goes with a dozen other conductors in the piece. No, the joy of the Kurtz recording is its sound, which is quite good. My only minor concerns are the same ones I had with Hi-Q's Swan Lake release: While there are track listings, they are rather ambiguous, and there are no timings for any of them. (To set matter straight, there are sixteen tracks, totaling about forty-two minutes). Furthermore, I had a really hard time getting the disc loose from its center spindle. As I say, minor issues, but slightly frustrating. The Hi-Q packaging, as always, is immaculate: A glossy, hardcover Digipak-type design; liner notes bound to the inside; the disc fastened to the inside back. Producer Peter Andry and engineer Neville Boyling recorded the music at Kingsway Hall, London, in March 1958 for EMI (now Warner Music Group). The Victor Company of Japan (JVC) remastered and manufactured the present disc using XRCD24 and K2 technology. The sound, as expected, is much like that of Hi-Q's Swan Lake, if anything a little warmer. The high mark is its midrange transparency. It is very clear, very detailed, and very clean. There is also a realistic stereo spread, a fine sense of orchestral depth, and a sparkling top end. The dynamic range, impact, and lowest bass impress one a little less. Not that there is anything seriously wrong with them, but they seem more ordinary than the rest of the sound. As I said about the previous Kurtz recording, too, the overall balance tends to favor the upper mids and lower treble a bit more than the bass end of the spectrum. So, if your system is at all bright, the recording might sound a tad forward. Still, that wonderful midrange clarity should more than compensate for any small shortcomings. Conductor Roger Nierenberg presents InSight Concerts, an immersive experience that places audience members in the midst of a symphony orchestra. Created for both the classical newcomer and aficionado alike, the initial performances will take place on September 17th and 18th at The DiMenna Center for Music in New York City and feature music by Wagner, Britten, Kodaly, Ravel and more. 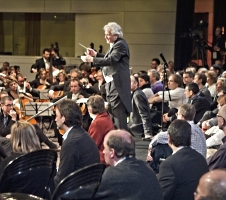 Over the past twenty years, conductor Roger Nierenberg has led hundreds of sessions with his company The Music Paradigm, taking executives from organizations such as Google, AT&T, Pepsi, Wal-Mart, and more, and placing them amidst a symphony orchestra in order to draw parallels between leading a rehearsal and leading a workforce. Now, Maestro Nierenberg will take his immersive experience from the boardroom to the concert hall, presenting InSight Concerts. The performances will place audience members next to the musicians, allowing them to watch the interactions as the conductor shapes the performance, even offering a chance to stand behind the podium themselves. Nierenberg believes this is also one of the best ways to introduce newcomers to classical music, saying of the experience: "I've noticed time and again how incredibly curious people get about the inner workings of the orchestra – the way the musicians communicate, the role of the conductor, the meaning of those puzzling gestures. And people get so excited to listen and observe from the place where the conductor stands, as well as to sit side-by-side with a musician. This concert is designed to provide all those opportunities, free from any distractions, and to provide the audience a chance to feel a real bond with the performers." Cal Performances at UC Berkeley to Launch Berkeley "Radical Inclusion"
Cal Performances begins the second season of its Berkeley Radical initiative by addressing one of the most pressing and immediate issues in contemporary society: Inclusion. A thematic strand that informs performances and activities spanning multiple genres from September 2016 – February 2017, Inclusion seeks to explore how universal themes can arise from diverse, culturally specific artists or ensembles, and how artists use the idea of inclusion in their creative process. Regardless of cultural backgrounds, audiences can see themselves in such works because the artists aim intentionally for inclusion. To launch the Inclusion engagement strand, and to open the 2016/17 season, September 30 – October 2, Cal Performances presents the world premiere of Layla and Majnun, a major new evening-length work by choreographer Mark Morris. The sets and costumes for Layla and Majnun were created by British artist Sir Howard Hodgkin, the lighting was designed by James F. Ingalls, and the music will be performed by the Silk Road Ensemble with Azerbaijan's preeminent mugham vocalists Alim Qasimov, named "one of the greatest singers alive" by the New York Times, and his daughter Fargana Qasimova. Layla and Majnun is a classic story of forbidden love most notably expressed by the great Persian poet Nizami Ganjavi. Cal Performances is proud to serve as the lead commissioner for Layla and Majnun, and as Mark Morris Dance Group's longtime West Coast home--this production marks the company's 13th world premiere presentation at Cal Performances. Tickets for Mark Morris Dance Group with the Silk Road Ensemble: Layla and Majnun, Friday–Saturday, September 30 – October 1, at 8pm; and Sunday, October 2 at 3pm, in Zellerbach Hall range from $36–$126 (prices subject to change). Half-price tickets are available for UC Berkeley students. Tickets are available through the Ticket Office at Zellerbach Hall, at (510) 642-9988, at calperformances.org, and at the door. For information about discounts, visit calperformances.org/discounts. Five Boroughs Music Festival (5BMF) today announces programming for its tenth anniversary season, continuing its mission of bringing affordable, high-caliber performances of traditional and contemporary chamber music to all five boroughs of New York City. As the centerpiece of its anniversary season, 5BMF launches the second volume of its Five Borough Songbook. The second iteration of the project features twenty new commissions of songs inspired by New York City places, themes and poetry, from twenty composers, and includes solo songs, duets and ensemble works scored for various combinations of voice, piano and cello. The 2016-17 season celebrates 5BMF's first decade by welcoming back some of its favorite artists and ensembles from previous years, beginning with two performances by GRAMMY-nominated vocal quartet New York Polyphony on Saturday, September 24 at 7:30 p.m. at Christ Church Riverdale in the Bronx, and on Sunday, September 25 at 5:00 p.m. at Trinity Evangelical Lutheran Church on Staten Island. The ensemble performs a mix of Renaissance and contemporary music, in a program entitled Passion, featuring works by Compere, Andrew Smith, de Penalosa and Kreek. The September 25th concert will feature Staten Island-based early music vocal ensemble Voyces, who will join the members of New York Polyphony for "Amid A Crowd of Stars" by Andrew Smith, an expanded version of his work Salme 55, originally written for New York Polyphony. For the full schedule, visit www.5BMF.org. Tickets for all Five Boroughs Music Festival concerts, ranging between $10 and $40, are available by visiting www.5BMF.org. If you're a fan of Philharmonia Baroque Orchestra & Chorale, you have a lot to look forward to. Our 2016/17 "Season of Heroes" will offer a range of incredible music experiences with an array of top guest artists culminating in a spectacular, fully-staged Rameau opera at Cal Performances. Individual tickets to this anticipated season are finally on sale now. Order with City Box Office or order online! Either way, act soon for the best available seating! 92Y's 16/17 season opens on October 15 with internationally renowned pianist Jeremy Denk joining the Saint Paul Chamber Orchestra, "the leading orchestra of its kind in America" (The New York Times), in their 92Y debut and their first New York performance in five years. Together, they open 92Y's illustrious concert season with the first New York premiere of "O Mikros, O Megas" (The Small World, The Huge World) by George Tsontakis, whose ties to the Orchestra have included three other world premieres earning a Grawermeyer Award and Grammy nomination. The orchestra also performs the Mozart Piano Concerto in A Major and Schubert's Symphony No. 2 in B-flat major with Denk, 2013 MacArthur Fellow and on the roster of SPCO's current Artistic Partners since 2014, as the piano soloist. Sunday, August 28, 2016 - 8:00 p.m.
Fellowship (Potluck Reception) will follow immediately after musical tribute with live jazz. Grammy-nominated, Boston-based ensemble, College New Music recently announced its 2016/2017 concert season. This year is the group's 45th Season and they will bring eight Boston premieres, three world premieres, a broad span of music by revered composers, and many newly composed pieces to audiences. According to CNM's founder, Frank Epstein, at the heart of the season is a renewal of CNM's passion about, and commitment to, the captivatingly eccentric music of the late Donald Sur. The Hilton Head International Piano Competition (HHIPC) will present its 2016 First Prize winner, ChangYong Shin, at Weill Recital Hall at Carnegie Hall on Saturday, November 19, 2016, 2:30 p.m. Mr. Shin will perform works by Bach, Beethoven, Unsuk Chin, Granados and Prokofiev. This performance is Mr. Shin's New York debut. Dr. Douglas Humpherys, the 2016 HHIPC Jury Chair (as well as Chair of the Piano Department at the Eastman School of Music and Artistic Director of the Gina Bachauer International Piano Competition), said about Mr. Shin, "He is a pianist with passionate expression and profound artistry, representative of the best among his generation!" Robert McDonald, Mr. Shin's teacher at the Curtis Institute of Music and The Juilliard School, said, "ChangYong Shin is a young artist of exceptional gifts—a brilliantly complete instrumentalist whose playing is always at the service of the music and its expressive possibilities." Saturday, November 19, 2016 at 2:30 p.m.
Tickets: $40 ($15 students, at Box Office only), available August 19, 2016, at carnegiehall.org; by calling CarnegieCharge (212) 247-7800; or by visiting the Carnegie Hall box office: 57th Street and Seventh Avenue. AOP Takes Operas to Space, Asylums, and a Human Uterus in "Six Scenes"
This fall, contemporary opera producer American Opera Projects (AOP) will present "Composers & the Voice: Six Scenes 2016," a concert of opera scenes from ten artists emerging in the world of contemporary opera. Audiences will get a first look at six wildly different new works that range from imagining moments in the lives of famous people such as Sigmund Freud and Mabel Dodge Luhan or events taking place in a spaceship, an asylum, and a uterus. The composers Matthew Barnson, Carlos R. Carrillo, Nell Shaw Cohen, Marc LeMay, Cecilia Livingston, and Sky Macklay and librettists Edward Einhorn, Duncan McFarlane, Emily Roller, and Mark Sonnenblick, were chosen by AOP to spend a year creating new works in its bi-annual fellowship program Composers & the Voice (C&V). The performances will be held on Friday, September 30 at 8:00pm at South Oxford Space (138 S. Oxford St.) in Fort Greene, Brooklyn, NY, the home of AOP, and on Sunday, October 2 at 2:30pm at the National Opera Center (330 7th Ave, 7th floor) in Manhattan. Tickets range from $10-$25 general admission and are available at www.aopopera.org. In anticipation of the new 2016/17 Season, the Wallis Annenberg Center for the Performing Arts, will throw open its doors and welcome the community for a two-day celebration of the performing arts. WelcomeFest will showcase many of the upcoming 2016/17 season's artists and other Los Angeles-based performers bringing their work to the Beverly Hills campus. WelcomeFest takes place Saturday, September 10 from 2pm – 10pm and Sunday, September 11 from 10am – 2pm. All performances and activities are free to the public. For complete listing of events and up-to-the-minute information, please visit TheWallis.org/WelcomeFest or join the WelcomeFest Facebook event. Detailed timeline and schedule for the weekend to be announced in early September. New Century Chamber Orchestra kicks off its 2016-2017 25th Anniversary Season, September 15-18, with a debut appearance by New York Philharmonic Artist-in-Association, Israeli pianist Inon Barnatan. Returning to the Bay Area following his critically acclaimed San Francisco Symphony East Coast Tour appearances in April 2016, Barnatan performs as soloist for Mozart's Piano Concerto No. 13 in C Major, K. 415. Also featured on the program are Langsamer Satz by Anton Webern, Symphony No. 3 by Philip Glass, and Happy Birthday Variations by Peter Heidrich. This opening performance set includes New Century's first-ever matinee concert on September 16 at the newly-renovated Herbst Theatre, Berkeley, CA. Immediately preceding the concert is the orchestra's inaugural Stuart Canin Award Luncheon in honor of Bay Area philanthropists Paula and John Gambs. The award is named for New Century's founding Music Director, Stuart Canin, and honors those who have made a deep impact on the arts in the Bay Area and beyond. All proceeds from the luncheon will support the Stuart Canin Artistic Fund, which benefits outreach and education initiatives. Subscriptions to the New Century Chamber Orchestra are on sale now. Three-concert subscriptions range from $78 to $165; festival passes range from $52 to $155. Call (415) 357-1111, ext. 305, or visit www.ncco.org to purchase. Single tickets range in price from $29 to $61 and are available through City Box Office: www.cityboxoffice.com and (415) 392-4400. Discounted $15 single tickets are available for students with a valid ID. Open Rehearsal tickets are $15 general admission and can also be purchased through City Box Office: www.cityboxoffice.com and (415) 392-4400. For further information on New Century, please visit www.ncco.org. Please join us for American Bach Soloists' annual fundraising gala, Sparkle 2016, on Friday, September 24, 5 p.m., at the historic James Flood Mansion, San Francisco, CA. Cocktails, hors d'oeuvres, and dinner will be served, and you'll enjoy an exclusive, intimate concert featuring baritone Mischa Bouvier and the American Bach Soloists. What's more, you'll be able to bid on some truly fantastic items! Our auction includes five nights for two in Bordeaux, France; a private dinner prepared by none other than Maestro Jeffrey Thomas at an astonishing San Francisco home; and an exclusive Twilight Tasting & Tour for six at Opus One Winery. Whether you're looking for something for yourself or to team up with friends for a larger item, there's going to be something for everyone! Also, Concerto in F; Three Preludes; Overture to Of Thee I Sing. Lincoln Mayorga, piano; Steven Richman, Harmonie Ensemble/New York. Harmonia Mundi HMU 907658. 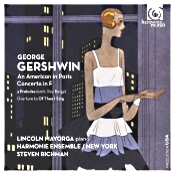 It's always good to see another recording of music by American composer and pianist George Gershwin (1898-1937). His fusion of popular and classical music will probably live on for as long as music exists. It's also especially good to hear his music presented in arrangements as close to Gershwin's original intentions as possible, as we find on the present album. Arranger, conductor, composer, and pianist Lincoln Mayorga handles the solo duties in the Concerto in F, while Steven Richman and the Harmonie Ensemble/New York handle the orchestral duties. It's a well-performed and well-recorded program, deserving one's attention. First up is the little Overture to "Of Thee I Sing," presented in its 1934 radio version. It gets things off to a rousing start, even if there is not much to it. Richman and his ensemble appear in good form and seem to be enjoying themselves, conditions carried over throughout the rest of the album. Next is the Concerto in F (1925), featuring Mr. Mayorga on piano and ably supported by Maestro Richman and the Harmonie Ensemble. This piece is a bit unusual in that the piano never quite dominates the music the way you might expect in a concerto. An Allegro opens the work in a big, robust, sweeping fashion, supposedly Gershwin's way of saying he could write a "proper" concerto after the popular success of Rhapsody in Blue a year before. The fact is, the Concerto is not as melodic as the Rhapsody, which is probably why it is not quite as memorable, yet the two works bear a marked resemblance to one another. Mayorga seems well suited to the temperament of the music and well conveys both the classical and jazz-inflected elements of the piece. The second-movement Adagio evokes the languorous, soulful mood of a nocturne, especially in the bluesy segment for trumpet and cornet and then in a more breezy, buoyant section when the piano enters. As Gershwin was a fan of Chopin, who wrote so many nocturnes, the similarities would seem appropriate. Mayorga's contribution is as jazzy as it can be while still maintaining a hold on the classical ingredients. His playing has a jaunty, airy feeling to it, with perhaps more of it leaning to the pop side of big, orchestral jazz than to Chopin, but who cares. It's ebullient and fun. Then the finale takes up where the first movement left off, big and bold. Here, Mayorga and Richman really catch fire and bring the show to an exhilarating close. I quite enjoyed the whole thing. Next on the program we find Three Preludes (1926) in first-ever recordings of their 1930s' arrangements by composer and pianist Roy Bargy. The pieces sound typically Gershwin, tiny miniatures of his bigger works, working together in a fast-slow-fast layout. Richman and his players take advantage of the music's conciseness, emphasizing the relationships with the music preceding it on the disc. Finally, we get the real star of the show, An American in Paris, with Richman and company again working from Gershwin's own manuscripts (and restoring the original saxophone parts). The work is, of course, a descriptive tone poem portraying an American visitor to Paris in the 1920's, strolling about and taking in the sights and sounds of the city. The colorful nature of the score never appears undermined by the leaner, more unsentimental nature of Gershwin's own goals. Richman takes the piece at a brisk pace; maybe our American visitor was on a tight schedule and needed to see as much of Paris in as short a period of time as possible. In any case, it does no harm, and it was maybe Gershwin's intention all along (since he reportedly hated the slow tempos of the world premiere performance in 1928). When the more leisurely sections come around, they sound all the more poignant in contrast. It's an enjoyable interpretation, if not quite capturing all the electric pulse of the work I've felt in the old Bernstein recording, and there's no questioning the impressive musicianship of the Harmonie Ensemble/New York. Producers Adam Abeshouse and Steven Richman and engineer Adam Abeshouse recorded the music at The DiMenna Center for Classical Music, New York City, in June 2014. The recording sounds particularly good in regard to clarity and dimensionally. There is a fair amount of transparency throughout the midrange, too, and the orchestral depth sounds realistically fulfilling. The piano in the second number sounds pretty well balanced, if a tad forward. Although an ultimate dynamic response and impact seem a little missing, I doubt many listeners will even notice, the rest of the audio is so good. The Wallis Annenberg Center for the Performing Arts announced today that single tickets are now on sale for all performances in the 2016/17 season. The upcoming season kicks off with the triumphant return of Los Angeles-based company For The Record's Scorsese: American Crime Requiem on September 21, and includes over 300 performances of more than 50 different programs of theater, dance and music featuring both local and world-renowned talent. Several concerts are almost sold out and special seating is still reserved for new subscribers. Top selling events include: Complicite/Simon McBurney's The Encounter, which comes to The Wallis on April 6 – 16, 2017 following a limited Broadway engagement; UK's most popular and successful choreographer/director Matthew Bourne's Early Adventures on May 18 – 21, 2017; the Zukerman Trio led by Pinchas Zukerman, one of the greatest violinist in the world, on October 30, 2016; the exciting jazz group The Brubeck Brothers Quartet on January 20, 2017; Leif Ove Andsnes and Marc-André Hamelin's extraordinary two piano concert on April 26, 2017; and leading contemporary jazz vocalist Diane Schuur on April 28, 2017. The Sorting Room—launching December 3, 2016 through January 14, 2017—will transform the Lovelace Studio into an intimate, custom-built club that delivers cabaret, comedy, contemporary music, and more, and connects upcoming artists and veteran entertainers with our audiences. The full schedule to be announced in early September 2016. To purchase single tickets, visit TheWallis.org, call 310.746.4000, or stop by in person at the Wallis Annenberg Center for the Performing Arts Ticket Services located at 9390 N. Santa Monica Blvd., Beverly Hills, CA 90210. Ticket prices subject to change. The National Philharmonic kicks off its 12th anniversary Sept. 17-18 at The Music Center at Strathmore, Maryland, with renditions of some of Ludwig van Beethoven's most popular works, led by Music Director and Conductor Piotr Gajewski. Performances include the Coriolan Overture in C Minor, Piano Concerto No. 4 in G Major, and Symphony No. 7 in A Major, one of Beethoven's most beloved symphonies. Among the program's highlights will be a performance by award-winning pianist Brian Ganz of the Piano Concerto No. 4, which he calls "arguably the greatest piano concerto ever composed." The start of the 2016-2017 season is especially nostalgic for both musicians, as the music comes full circle with some of the pair's most memorable childhood performances. Opening night is Saturday, Sept. 17 at 8 p.m., followed by a performance on Sunday, Sept. 18 at 3 p.m. at Strathmore. Ticket prices start at $28 and are free for children ages 7-17. Strathmore is located at 5301 Tuckerman Lane, North Bethesda, MD 20852. For more information or to purchase tickets, visit www.nationalphilharmonic.org or call 301.581.5100. Concerto Novo is proud to present "An Evening of Classical and New Music" at Carnegie Hall on October 1, 8 PM. The concert will feature the World Premiere of George Oakley's Stabat Mater, and the U.S. debut of up-and-coming Georgian cellist Lizi Ramishvili. Tickets are now available at carnegiehall.org for $35 and $45 (students $25). With animosity between the USA and the USSR at a fever pitch, an unlikely emissary of hope burst onto the world stage and initiated a fleeting thaw. In Moscow Nights: The Van Cliburn Story--How One Man and His Piano Transformed the Cold War (Harper; $28.99; hardcover; on sale September 20, 2016), acclaimed author Nigel Cliff crafts an extraordinary account of the piano wunderkind whose playing resonated on both sides of the ideological divide and mitigated hostilities between two superpowers locked in the ultimate high-stakes standoff. Van Cliburn, a then-obscure pianist from Julliard in his early twenties, journeyed to Moscow in 1958 to participate in the First International Tchaikovsky Competition. The fix was in, though--a native musician had already been selected to win. Yet when the towering Texan with the bashful manner and prodigious talent began to perform, he captivated listeners not only in the audience but throughout the nation as well. The American became an overnight sensation, beguiling the Soviets with his skill, charisma, and humility. But it was his genuine affection for their music that truly captured their hearts. Many believed that this fresh-faced visitor sounded more Russian their fellow citizens. As Cliburn-mania spread, the final decision about the competition's outcome came straight from the top: When the judges affirmed that Cliburn was indeed the best, Premier Nikita Khrushchev decreed that the foreign prodigy should be the victor. After conquering the USSR, Cliburn arrived home in triumph.While serving as a symbol for peace in a climate filled with fear, he emerged as an iconic figure in popular culture, even receiving the rare honor of a tickertape parade. In this immersive, rigorously researched narrative, Cliff draws from previously untapped sources to chronicle a tumultuous period shadowed by the threat of nuclear war and inhabited by a fascinating cast of characters. Illuminating history through a unique lens, Moscow Nights is anchored by an insightful look at the gifted but complicated individual who, however briefly, provided common ground for adversaries on the brink of mutual destruction. Nigel Cliff is a historian, biographer, critic, and translator. A former film and theater critic for the London Times and contributor to The Economist, he writes for a range of publications, including the New York Times Book Review. A graduate of Oxford University, he lives in London. At once a riveting depiction of the Cold War era rendered with vivid immediacy and an indelible portrait of a game-changing artist, Moscow Nights is an altogether transcendent achievement. The California Symphony and Music Director Donato Cabrera open the Orchestra's 30th season on Sunday, September 18 at 4 pm at the Lesher Center for the Arts in Walnut Creek, with an early work by Pulitzer Prize-winning composer Kevin Puts, written when he was a Young American Composer-in-Residence there, a performance of Rachmaninoff's Symphony No. 2, and flutist Annie Wu, an East Bay native and SF Symphony Youth Orchestra alumna, as soloist in Mozart's Flute Concerto in G.
The Orchestra's 2016-17 season highlights the music of its celebrated Young American Composers-in-Residence, with works by the program's alumni on each of its concerts, including, in addition to Kevin Puts (in residence from 1996-99), music by Christopher Theofanidis (1994-96), Pierre Jalbert (1999-2002), Kevin Beavers (2002-05), and current resident composer Dan Visconti (2014-17). Throughout its 30-year history, the Orchestra has made American repertoire its special focus, nurturing and commissioning work from emerging American composers as well as performing the most revered core classical repertoire. Tickets for the September 18 concert are on sale and priced at $42-$72, and $20 for students, subject to change. For more information, call 925-943-7469 or visit www.californiasymphony.org. Musica Viva, a chamber chorus of highly skilled professionals and volunteer musicians, dedicated to sharing the transcendent power of choral and instrumental music under the artistic direction of Dr. Alejandro Hernandez-Valdez, embarks upon its 39th season. This season will build on the programmatic concepts explored in the 2015-16 season, Dr. Hernandez-Valdez's first season as Artistic Director. Through both its traditional four-concert series at All Souls Church, NYC, and through three unique benefit concerts at NY229 and at All Souls Church, Musica Viva will continue to perform beloved as well as rarely heard vocal works, both choral and solo, from various periods of musical history and from diverse cultures worldwide. Programmatic highlights of the season include the Bach "Michelmas" cantatas, Joachim Linckelmann's rarely heard chamber arrangement of Brahms's Ein deutsches Requiem, and a concert featuring the chorus moving throughout the All Souls sanctuary in an exploration of sound and space. The Aeolus String Quartet is Musica Viva's quartet in residence for its second season and Associate Music Director of Musica Viva, organist Renée Anne Louprette, is also featured throughout the season. Subscription tickets, priced at $100, and single tickets, priced at $30, for the four-concert series at All Souls Church are available by visiting http://musicaviva.org/tickets/. Single tickets are also available at the door on the evening of the concert. MUSICAnocturna concert tickets, priced at $100, will be available online. The Take Five concert on January 29 is free and open to the public with a free-will donation to benefit Musica Viva's current season. ClassicsOnline's Collections library offers hi-resolution recordings for classical music fans of all stripes. Whether you're an expert or novice, ClassicsOnline's streaming and download platforms are designed with the discerning listener in mind, delivered with the highest possible sound quality, ranging from 16-bit, 44.1khz all the way up to 24-bit, 192khz. Currently featured are Naxos' 50 of the Best, The Yo-Yo Ma Collection, Recommended by Gramophone, and The 24-Bit High-Resolution Audio Collection, just to name a few. General public on sale begins Tuesday, Aug. 16 at 10 a.m.
You may have heard some rumblings. Philharmonia Baroque Orchestra & Chorale is mounting its first-ever, fully-staged opera next April. But it's not just any opera, it's the modern-day premiere of the long-forgotten original version of Jean-Philippe Rameau's Le Temple de la Gloire. The work was first performed in Versailles in November 1745. François-Marie Arouet (aka Voltaire) wrote the libretto and, being the firebrand that he was, presented a philosophical reform of opera with moral and political overtones. But after its original debut, King Louis XIV and the public gave it a big thumbs-down. So Rameau was obliged to remove any political offenses and add a love story to create the version that has been heard up until now. Meanwhile, a single, original, un-edited manuscript survived in various archives until it eventually ended up at U.C. Berkeley's Hargrove Music Library. When PBO music director Nicholas McGegan learned of its existence, he became thrilled at the possibilities. After Philharmonia recorded several movements from the score in the mid-1990's, he hoped that he would one day be able to mount the entire opera. Now twenty years later, he finally has that chance. Longtime PBO oboist Gonzalo Ruiz locked in an accompanist for life when he married his perfect match, Handel & Haydn violinist Tatiana Daubek, in June. The two took their vows with friends and family in Fort Tyron Park in New York on June 12 and are honeymooning now. In addition to being our "first-call" oboist, Gonzalo is on staff at The Juilliard School and the Longy School of Music in Massachusetts and also serves as Associate Artistic Director for Musica Angelica in L.A. Tatiana plays with The Handel & Haydn Society in Boston and other east coast groups in addition to being a professional photographer. The two share a love of cooking, baroque music and dance. Gonzalo shared a tidbit about their creative relationship while on his honeymoon. "We both like to cook, but I wind up doing most of that. We also dance tango rather well, but here on our honeymoon I'm mostly forcing her to play her violin while I practice my baroque guitar accompaniment, which is this year's personal growth project." With baroque music, home-cooked meals, tango and "personal growth projects" on the horizon, married life at the Ruiz home sounds great. We congratulate this talented couple and wish them the very best in life, love and music. Fritz Reiner, Royal Philharmonic Orchestra. HDTT remastered. 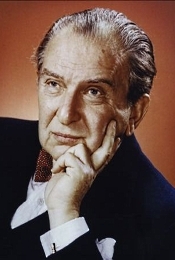 The Hungarian-born conductor Fritz Reiner (1888-1963) enjoyed a prominent career, especially working in Europe with Richard Strauss, and then in America, to which country he emigrated in 1922. For most of us, though, he probably did his most notable work with the Chicago Symphony and RCA in the early days of stereo from 1954-1963. However, during those last years, he didn't record exclusively with Chicago, as this disc demonstrates. 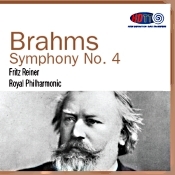 He recorded the Brahms Fourth with the Royal Philharmonic at the very end of his life, making it as a part of a Reader's Digest series of LP's and tapes. In fact, he had apparently committed to yet another recording with them, but ill health prevented it, and he died shortly thereafter. In any case, what we have here is a remastering from HDTT (High Definition Tape Transfers) of that early Sixties performance, and at its price and availability, it is welcome, indeed. German composer Johannes Brahms (1833-1897) premiered his Symphony No. 4 in E minor, Op. 98 in 1885, the symphony the last of four he wrote and possibly his most wholly satisfying. The opening movement begins gracefully and builds in dramatic tension using some of the composer's most memorable tunes. It is only here that Reiner displays a degree of idiosyncrasy, and I hope it doesn't put off too many listeners. The fact is, Reiner is quicker through the first movement than almost any conductor in my experience. Now, it was not unusual for Reiner to create a strong forward momentum in his recordings. His Beethoven Fifth with Chicago moves at practically a breakneck speed, yet it is one of the most thrilling experiences on record. Here, however, the accelerated gait seems to rush what should have been a more-peaceful tone. In any case, it prepares us appropriately for the Andante that follows. The second-movement Andante moderato is placid and serene, wearing its heart on its sleeve, accompanied by a plush orchestral arrangement. The Royal Philharmonic sounds its finest in this movement, with Reiner never pushing it or the score. In fact, Reiner, who most always stuck to the letter of the composer's intentions, articulates the music in soft, glowing terms, his timing a bit slower than most other conductors in order to more fully explore the tranquil mood. The third movement Scherzo is cheerful, festive, and exuberant, providing the symphony a sudden note of excitement and happiness. Reiner conveys this exuberance with alacrity, and it's a high point of the interpretation. The Finale is powerful and relatively serious, the composer noting that the conductor should play it with energy and passion ("energico e passionato"). This is exactly what Maestro Reiner does, although it is no headlong rush; it is a sensible and reasoned account, with the Royal Philharmonic responding in kind. Reiner's recording must be considered among the most worthy in the catalogue, and one should not count any minor misgivings against it. 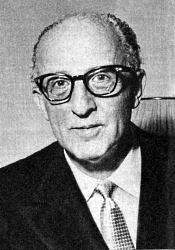 For most listeners, Reiner's way with the music will be a heaven-sent answer to other more-bland renderings of the work. RCA producer Charles Gerhardt and Decca engineer Kenneth Wilkinson recorded the symphony in the early 1960's for the Reader's Digest series, with RCA rereleasing it in 1966. HDTT transferred the recording in 2016 from a 15ips 2-track tape studio duplication using Dolby NR. Because this was a different orchestra and a different venue for Reiner from his usual Chicago Symphony Orchestra, the sound is a little different, too. It's not quite as wide in its stereo spread and not quite as transparent as the RCA Living Stereo presentations. Yet it's just as lifelke, perhaps even more so for being miked a tad more distantly. There's a wonderful sense of space and depth to the ensemble, with a mild ambient bloom to make everything appear quite natural. More to the point, HDTT's transfer of the recording to CD appears letter-perfect. Highs are a tad forward, yet they don't seem out of sync with the rest of the reproduction, which is realistically well balanced. Clarity, which may not be quite that of Chicago, is, nevertheless, quite good. Overall, it's another fine issue from a company that reminds us just how good early stereo recordings were. Kevin Puts's new song cycle, Letters from Georgia, will receive World Premiere performances by Renée Fleming. Based on the letters of Georgia O'Keeffe, the work will be premiered at Eastman Theater on November 12, and then at Lincoln Center's Alice Tully Hall on November 14.
Letters from Georgia, a new song cycle based on the letters of painter Georgia O'Keeffe and composed by Pulitzer Prize-winner Kevin Puts, will receive its world premiere performances on November 12th and 14th, sung by four-time Grammy Award-winning soprano Renée Fleming and accompanied by the Eastman Philharmonia under the direction of Neil Varon. The songs are based on O'Keeffe's expressive letters, written mainly to her eventual husband Alfred Stieglitz and artist and suffragette Anita Pollitzer. Puts wrote the cycle for, and in close collaboration with, Ms. Fleming. There will be two concerts featuring Letters from Georgia: Saturday, November 12th at 8pm at The Kodak Hall at Eastman Theatre in Rochester, NY; and Monday, November 14th at 8pm at Lincoln Center's Alice Tully Hall in New York City. Puts, who won the Pulitzer Prize in 2012 for his opera Silent Night, says of O'Keeffe's writings: "I found that her letters reveal aspects of her personality one doesn't necessarily associate with her. She could be stoic and aloof but her letters also revealed tremendous passion and longing, self-deprecating humor, and also often great sadness. September 30: PBS Great Performances broadcast of the Vienna Philharmonic Summer Night Concert 2016. October 2016: Recording release of Tchaikovsky's Sixth Symphony ("Pathétique") and the Romeo and Juliet Fantasy Overture with the Czech Philharmonic on Decca Classics, the first release in a Tchaikovsky recording cycle. November 29, 30: Mahler's Fifth Symphony and Detlev Glanert's Theatrum bestiarum with the Royal Concertgebouw Orchestra at The Kennedy Center and Carnegie Hall. January 24 – February 11: Beloved Friend: Tchaikovsky and His World, the New York Philharmonic's three-week festival curated by Mr. Bychkov. September 17 – October 16: Verdi's Macbeth at LA Opera, featuring Plácido Domingo. January 28 – February 19: Mozart's The Abduction from the Seraglio at LA Opera. February 18 – March 19: Strauss's Salome at LA Opera, featuring Patricia Racette in Sir Peter Hall's 1986 production. April 6–8: Works by Shostakovich, Britten, and Prokofiev with the National Symphony Orchestra, featuring pianist Lisa de la Salle. April 22 – May 13: Puccini's Tosca at LA Opera. September 9: Recording release of Liszt's Transcendental Études on Myrios Classics. February 2–4, 7: N.Y. premiere of Tchaikovsky's First Piano Concerto in its 1879 urtext edition with conductor Semyon Bychkov and the New York Philharmonic. February 23–26: Rachmaninoff's Second Piano Concerto with conductor Xian Zhang and the New Jersey Symphony Orchestra. March 1: Brahms's Piano Quintet in F minor, Op. 34 with the Hagen Quartet at Carnegie's Zankel Hall. March 10, 11: Busoni's Piano Concerto with Finnish conductor Sakari Oramo and the Boston Symphony Orchestra. April 7–9: Gershwin's Concerto in F and Rhapsody in Blue with conductor David Robertson and the St. Louis Symphony. May 16, 21, June 11: Liszt's Transcendental Études and Brahms's Second Piano Sonata at the Seattle's Meany Hall, UDC's Theatre of the Arts in Washington, D.C. and the Chicago Symphony Center. January 11–14: Beethoven's Fifth Piano Concerto ("Emperor") with conductor Alan Gilbert and the New York Philharmonic. April 22: Works by Debussy on a program with Mr. Hough's own choral compositions, performed by VocalEssence. September 9: Recording release of Tchaikovsky: Complete Works for Violin and Orchestra with Alexander Vedernikov and the Odense Symphony Orchestra on Cedille Records. October 1: World premiere of Christopher Rountree's Violin Concerto with wild Up as part of the Los Angeles Philharmonic's "From Noon to Midnight" festival. October 15: People's Symphony Concert with pianist Shai Wosner, featuring works by Beethoven, Debussy, Fauré, Kaija Saariaho, and György Kurtág. October 28–30: Kaija Saariaho's violin concerto Graal théâtre with the Curtis 20/21 Ensemble. November 30: Variation String Trio performs works by Kaija Saariaho, Andrew Norman, and György Kurtág at 92nd Street Y.
December 24: Mozart's Violin Concerto No. 3 with conductor Jaime Laredo and the New York String Orchestra. March 21: Bridge to Beethoven Program I with pianist Shai Wosner, featuring the Philadelphia premiere of Vijay Iyer's Bridgetower Fantasy. March 30, April 2: Steven Mackey's Beautiful Passing with conductor Marin Alsop and the Baltimore Symphony Orchestra. May 11–14: Sibelius's Violin Concerto with conductor Xian Zhang and the New Jersey Symphony Orchestra. September 9: Recording release of Sibelius's Third, Sixth, and Seventh Symphonies on BIS Records. September 22, 23: 2016–17 season launch. November 11, 12: World premiere of Claudio Puntin's Clarinet Concerto and performance of Mahler's Sixth Symphony, recorded for future release. January 8–10: Florida tour to Naples, Sarasota, and Miami. Cellist Alisa Weilerstein performs as soloist on January 8 and 9. January 30 – February 3: 2017 Minnesota Orchestra Composer Institute, including a subscription concert conducted by Mr. Vänskä. October 15, 16: Launch of 2016–17 WALLCAST season. October 29: NWS alumnus Teddy Abrams returns to conduct American works. November 4: PULSE: Late Night at the New World Symphony, fall program. November 20: "Taking the Prize: a Pulitzer Centennial Celebration," a program featuring Steve Reich's Double Sextet. March 3: PULSE: Late Night at the New World Symphony, spring program. April 29: New Work concert. October 27: N.Y. premiere of Jessie Montgomery's Records from a Vanishing City and performance of Beethoven's First Piano Concerto with Christian Zacharias. December 3: Fazil Say performs Mozart's Piano Concerto No. 21 and his own Piano Concerto No. 2. January 15 – February 5: Eastern U.S. tour and Carnegie Hall performance. Program features world premiere of Michael Hersch's End Stages and the Tchaikovsky Violin Concerto with Vadim Gluzman. March 18: Schumann's Cello Concerto with Alisa Weilerstein. September 9–30: Umberto Giordano's Andrea Chénier in a production by Sir David McVicar. September 10–29: World premiere of composer Bright Sheng and playwright David Henry Hwang's Dream of the Red Chamber. February 24–26, March 1–3: SF Opera Lab presents Ted Hearne's The Source. September 7–11: Steve Reich 80th birthday celebration conducted and curated by Michael Tilson Thomas. September 28 – October 1: World premiere of Bright Sheng's "Overture" to Dream of the Red Chamber, an SFS commission and concert suite based on Sheng and playwright David Henry Hwang's new opera for the San Francisco Opera (September 10–29). October 28: All-Debussy album released on SFS Media. December 9, 10: SoundBox season opens with a Lou Harrison centennial celebration curated and hosted by MTT. January 13–15: Semi-staged production of Mahler's Das klagende Lied, conceived and conducted by MTT. 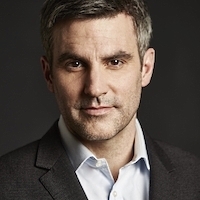 January 20, 21: SoundBox program curated by DJ and composer Mason Bates. February 10, 11: SoundBox program of music by young composers curated by John Adams. February 16–18, 22–25: John Adams 70th birthday celebration. March 10, 11: SoundBox program of Italian repertoire curated by MTT. April 5–8: Concerts in Chapel Hill and New York (Carnegie Hall), featuring cellist Gautier Capuçon. April 14, 15: SoundBox program curated by SFS principal trombonist Tim Higgins. June 23–25: West Coast premiere of MTT's Four Preludes on Playthings of the Wind. The program also continues SFS's Lou Harrison centennial celebration with a performance of his Suite for Symphonic Strings. Fall 2016: Recording release of Mahler's Eighth Symphony ("Symphony of a Thousand") with the Mormon Tabernacle Choir and The Madeleine Choir School on Reference Recordings. ClassicsOnline has released the newest version of their mobile app, a companion to their classical music streaming service. Available for iOS and Android, classical music enthusiasts will enjoy the highest possible sound quality allowed by their connection with no buffering or loss of signal, ranging from 16-bit, 44.1 kHz all the way up to 24-bit, 192 kHz, while exploring new releases, award-winners, global best-sellers, and expertly curated playlists. The ClassicsOnline mobile app for iOS and Android makes it effortless to take their streaming service with you. Free with both the monthly and annual ClassicsOnline subscription plans, this app allows you to browse new releases, critically acclaimed award-winners, global best-sellers, and their expertly curated playlists. New England Conservatory presents 1,000 free musical performances and events during the 2016-2017 season: Orchestral and chamber music, opera, vocal and choral performances, recitals, masterclasses and more. Fall highlights include: Miriam Fried's 70th Birthday Bash with Bach, Celebration of Erik Satie's Music, 100th Anniversary of the Debussy Trio for Flute, Harp & Viola World Premiere in Jordan Hall featuring Kim Kashkashian, et al., and a Masterclass with Yo-Yo Ma. New England Conservatory announces an exciting fall season filled with wonderful special events, orchestral, vocal and opera performances, masterclasses. and more. The Chiara String Quartet (Rebecca Fischer and Hyeyung Julie Yoon, violins; Jonah Sirota, viola; Gregory Beaver, cello) will perform all six of Béla Bartók's string quartets by heart, or from memory, a feat never attempted before, at the Ravinia Festival in Bennett Gordon Hall (201 St. Johns Ave.) on September 7 (Quartets Nos. 1, 3, and 5) and September 8 (Quartets Nos. 2, 4, and 6) at 6pm. Bartók's quartets highlight an incredible life in music, from his journey uncovering rare folk music of Europe and Northern Africa to his final exodus from Hungary to America on the eve of World War II. This cycle brings his amazing, colorful works to life in vivid performances. Lindsey Stirling is one of the biggest artist development breakthrough stories in recent years. A classically trained violinist, Lindsey has entered a futurist world of electronic big beats and animation. On stage, Stirling moves with the grace of a ballerina but works the crowd into a frenzy, "dropping the beat" like a rave fairy. 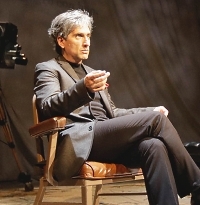 The Wallis Annenberg Center for the Performing Arts presents the final West Coast engagement of the critically-acclaimed Hershey Felder as Leonard Bernstein in "Maestro" from August 10 – 28. In "Maestro," Felder channels the great composer and conductor Leonard Bernstein, drawing audiences deeply into the maestro's fascinating life, one filled with tragedy, triumph, and extraordinary music. The Wallis' production marks the final West Coast engagement prior to a highly-anticipated transfer to New York City's 59E59 Theaters from August 31 – October 16.